"The LORD your God will raise up for you a prophet like me from among you, from your brothers—it is to him you shall listen—just as you desired of the LORD your God at Horeb on the day of the assembly, when you said, 'Let me not hear again the voice of the LORD my God or see this great fire any more, lest I die.' And the LORD said to me, 'They are right in what they have spoken. I will raise up for them a prophet like you from among their brothers. And I will put my words in his mouth, and he shall speak to them all that I command him. And whoever will not listen to my words that he shall speak in my name, I myself will require it of him. 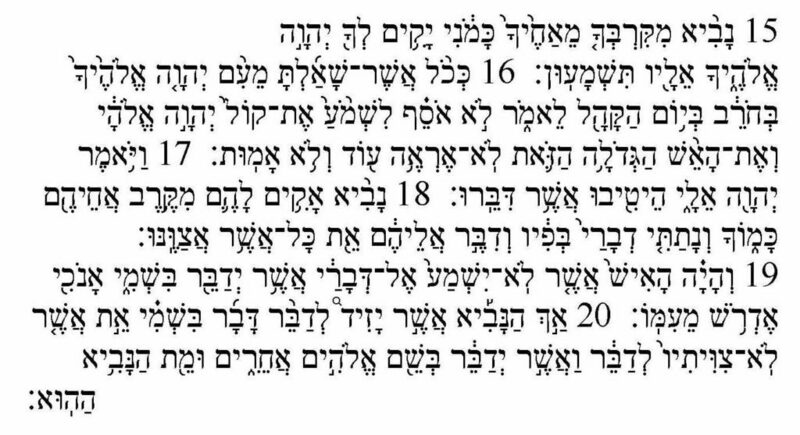 But the prophet who presumes to speak a word in my name that I have not commanded him to speak, or who speaks in the name of other gods, that same prophet shall die.'" 8:1 Περὶ δὲ τῶν εἰδωλοθύτων, οἴδαμεν ὅτι πάντες γνῶσιν ἔχομεν. ἡ γνῶσις φυσιοῖ, ἡ δὲ ἀγάπη οἰκοδομεῖ· 8:2 εἴ τις δοκεῖ ἐγνωκέναι τι, οὔπω ἔγνω καθὼς δεῖ γνῶναι· 8:3 εἰ δέ τις ἀγαπᾷ τὸν θεόν, οὗτος ἔγνωσται ὑπ᾽ αὐτοῦ. 8:4 Περὶ τῆς βρώσεως οὖν τῶν εἰδωλοθύτων, οἴδαμεν ὅτι οὐδὲν εἴδωλον ἐν κόσμῳ καὶ ὅτι οὐδεὶς θεὸς εἰ μὴ εἷς. 8:5 καὶ γὰρ εἴπερ εἰσὶν λεγόμενοι θεοὶ εἴτε ἐν οὐρανῷ εἴτε ἐπὶ γῆς, ὥσπερ εἰσὶν θεοὶ πολλοὶ καὶ κύριοι πολλοί, 8:6 ἀλλ᾽ ἡμῖν εἷς θεὸς ὁ πατὴρ ἐξ οὗ τὰ πάντα καὶ ἡμεῖς εἰς αὐτόν, καὶ εἷς κύριος Ἰησοῦς Χριστὸς δι᾽ οὗ τὰ πάντα καὶ ἡμεῖς δι᾽ αὐτοῦ. 8:7 Ἀλλ᾽ οὐκ ἐν πᾶσιν ἡ γνῶσις· τινὲς δὲ τῇ συνηθείᾳ ἕως ἄρτι τοῦ εἰδώλου ὡς εἰδωλόθυτον ἐσθίουσιν, καὶ ἡ συνείδησις αὐτῶν ἀσθενὴς οὖσα μολύνεται. 8:8 βρῶμα δὲ ἡμᾶς οὐ παραστήσει τῷ θεῷ· οὔτε ἐὰν μὴ φάγωμεν ὑστερούμεθα, οὔτε ἐὰν φάγωμεν περισσεύομεν. 8:9 βλέπετε δὲ μή πως ἡ ἐξουσία ὑμῶν αὕτη πρόσκομμα γένηται τοῖς ἀσθενέσιν. 8:10 ἐὰν γάρ τις ἴδῃ σὲ τὸν ἔχοντα γνῶσιν ἐν εἰδωλείῳ κατακείμενον, οὐχὶ ἡ συνείδησις αὐτοῦ ἀσθενοῦς ὄντος οἰκοδομηθήσεται εἰς τὸ τὰ εἰδωλόθυτα ἐσθίειν; 8:11 ἀπόλλυται γὰρ ὁ ἀσθενῶν ἐν τῇ σῇ γνώσει, ὁ ἀδελφὸς δι᾽ ὃν Χριστὸς ἀπέθανεν. 8:12 οὕτως δὲ ἁμαρτάνοντες εἰς τοὺς ἀδελφοὺς καὶ τύπτοντες αὐτῶν τὴν συνείδησιν ἀσθενοῦσαν εἰς Χριστὸν ἁμαρτάνετε. 8:13 διόπερ εἰ βρῶμα σκανδαλίζει τὸν ἀδελφόν μου, οὐ μὴ φάγω κρέα εἰς τὸν αἰῶνα, ἵνα μὴ τὸν ἀδελφόν μου σκανδαλίσω. Therefore, as to the eating of food offered to idols, we know that “an idol has no real existence,” and that “there is no God but one.” For although there may be so-called gods in heaven or on earth—as indeed there are many “gods” and many “lords”—yet for us there is one God, the Father, from whom are all things and for whom we exist, and one Lord, Jesus Christ, through whom are all things and through whom we exist. 1:21 Καὶ εἰσπορεύονται εἰς Καφαρναούμ· καὶ εὐθὺς τοῖς σάββασιν εἰσελθὼν εἰς τὴν συναγωγὴν ἐδίδασκεν. 1:22 καὶ ἐξεπλήσσοντο ἐπὶ τῇ διδαχῇ αὐτοῦ· ἦν γὰρ διδάσκων αὐτοὺς ὡς ἐξουσίαν ἔχων καὶ οὐχ ὡς οἱ γραμματεῖς. 1:23 καὶ εὐθὺς ἦν ἐν τῇ συναγωγῇ αὐτῶν ἄνθρωπος ἐν πνεύματι ἀκαθάρτῳ καὶ ἀνέκραξεν 1:24 λέγων, Τί ἡμῖν καὶ σοί, Ἰησοῦ Ναζαρηνέ; ἦλθες ἀπολέσαι ἡμᾶς; οἶδά σε τίς εἶ, ὁ ἅγιος τοῦ θεοῦ. 1:25 καὶ ἐπετίμησεν αὐτῷ ὁ Ἰησοῦς λέγων, Φιμώθητι καὶ ἔξελθε ἐξ αὐτοῦ. 1:26 καὶ σπαράξαν αὐτὸν τὸ πνεῦμα τὸ ἀκάθαρτον καὶ φωνῆσαν φωνῇ μεγάλῃ ἐξῆλθεν ἐξ αὐτοῦ. 1:27 καὶ ἐθαμβήθησαν ἅπαντες ὥστε συζητεῖν πρὸς ἑαυτοὺς λέγοντας, Τί ἐστιν τοῦτο; διδαχὴ καινὴ κατ᾽ ἐξουσίαν· καὶ τοῖς πνεύμασιν τοῖς ἀκαθάρτοις ἐπιτάσσει, καὶ ὑπακούουσιν αὐτῷ. 1:28 καὶ ἐξῆλθεν ἡ ἀκοὴ αὐτοῦ εὐθὺς πανταχοῦ εἰς ὅλην τὴν περίχωρον τῆς Γαλιλαίας. And they went into Capernaum, and immediately on the Sabbath [Jesus] entered the synagogue and was teaching. And they were astonished at his teaching, for he taught them as one who had authority, and not as the scribes. And immediately there was in their synagogue a man with an unclean spirit. And he cried out, “What have you to do with us, Jesus of Nazareth? Have you come to destroy us? I know who you are—the Holy One of God.” But Jesus rebuked him, saying, “Be silent, and come out of him!” And the unclean spirit, convulsing him and crying out with a loud voice, came out of him. And they were all amazed, so that they questioned among themselves, saying, “What is this? A new teaching with authority! He commands even the unclean spirits, and they obey him.” And at once his fame spread everywhere throughout all the surrounding region of Galilee. 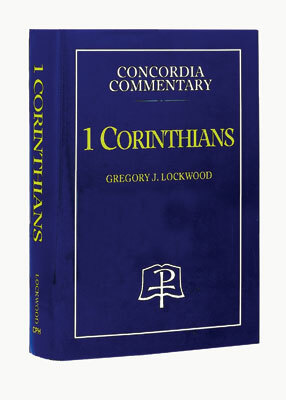 The following is from 1 Corinthians, Concordia Commentary series, by Gregory J. Lockwood copyright © 2000 Concordia Publishing House. “In the face of this complacent attitude, Paul begins his pastoral response with this general truth: ‘knowledge puffs up’ (8:1). The possession of a superior degree of religious knowledge did not guarantee that those who had it would take the right attitude toward the issue of idol-meat. For the acquisition of expertise—be it religious, philosophical, or whatever—tends to inflate a person with a sense of superiority over others. This boasting in self, then, rather than in the Lord (cf. 1:31) puts him at odds with the Lord’s purposes for his church. The Lord wants his church to be built up as a community, and that can only happen when its members display unselfish love for one another (cf. 10:23). This ‘love’ is not ‘puffed up’ (13:4). Such love will be patterned on the ‘example of Christ, who died for the weak ([8:]11), and also the example of Paul, who is willing to renounce all meat in order to keep his brothers and sisters from stumbling ([8:]13)'" (pp. 277–78).